Say hi to your new, low-power audio amplifier with digital volume control – the AudioAmp 4 click! It is equipped with the LM4860, an audio amplifier IC capable of delivering up to 1W of continuous power to an 8 Ω load. The Click board™ has a very low total harmonic distortion (THD) - less than 1% over the entire audio spectrum, which makes it perfectly suited for small boom-boxes, PC speakers, and similar low-power sound reinforcing devices that can be powered by batteries. A high integration level of the LM4860 IC allows an additional circuit for digital signal attenuation to be used, offering 8 different volume levels, selectable over GPIO pins of the mikroBUS™. In addition to the possibility to attenuate the input signal from the included 3.5mm JACK connector, the AudioAMP 4 click can also provide a selectable analog control voltage (CV) attenuation, derived from the PWM signal at the mikroBUS™ PWM pin. 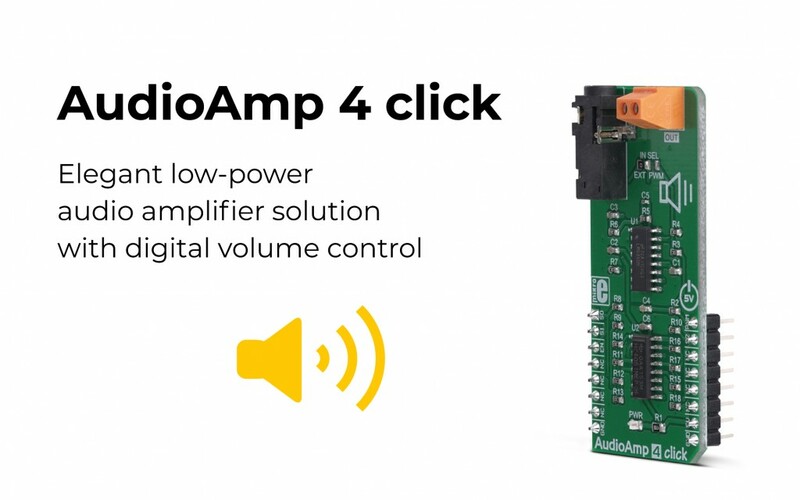 If you’re looking for a perfect solution for rapid development of applications where a quick and simple low-power audio signal reinforcement is required, the AudioAmp 4 click is the one! For more information about the AudioAmp 4 click, please visit our website.